Wow. Welcome! Hopefully you had a chance to read the intro to this little project. If you haven’t, you can find it here. And make sure you subscribe to the newsletter for some bonus stuff that won’t be on the site. Hook up two bands (I used monster mini bands) to the sides of a power rack. 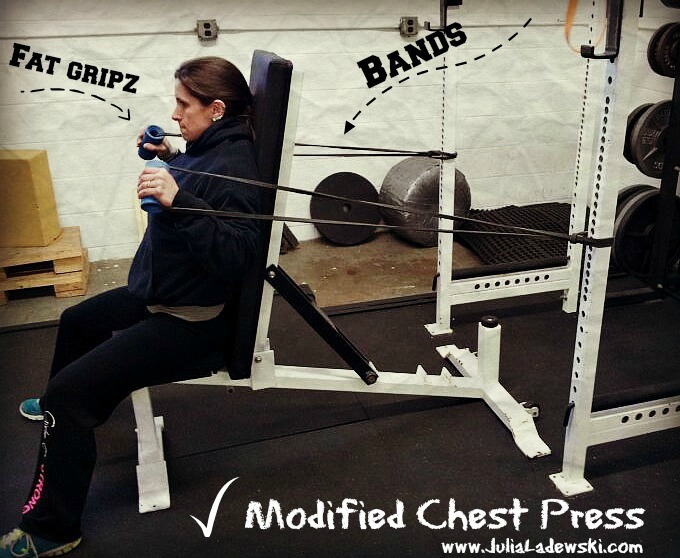 Press the bands out and squeeze your pecs at the end of the movement. The stability needed combined with the greater band tension at the end of the range of motion really makes this a pretty pec-fatiguing exercise. So why would you do this exercise? Well, of course, if you’re looking for a bodybuilding-type exercise to simulate a chest press. It would also be a great finishing movement on bench day. And some extra work for those that are looking to build their pushups. It would also work well as a recovery exercise on off-days. Just play around with the intensity based on the goal you’re looking for.